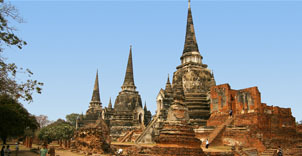 The extensive ruins and historical records demonstrated that Ayutthaya is one of the most prosperous cities. In recognition of its historical and cultural importance, the Historical Park was declared a Unesco World Heritage site in 1991. 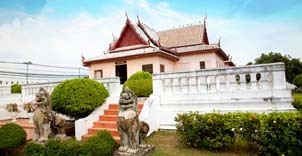 The must-see sites includes Wat Phra Si Sanphet, Wat Maha That and Wat Mongkhon Bophit. 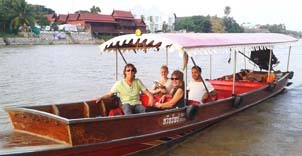 We offer a group tour or a private tour of Ayutthaya rivers by Boat. In 2 hours, you will travel along the Pa-Sak River and the Chao Phraya River with stops at 3 beautiful temples namely Wat Phanan-Cherng, Wat Phutthaisawan, and Wat Chaiwatthanaram. Only 30 minutes from the city, you will enjoy a walking tour of King Rama V Summer Palace showcases beautiful landscape and architecture. You can choose to have lunch at one of the local restaurant by the river, and continue your tour of the Folk Arts Center where you can have a glimpse of how the villagers in the region live and work, and how local arts and crafts are produced.